Sunshine was the inspiration for Texas Cattle Dog Rescue. Rescued from a Houston-area shelter, Sunshine was already an older dog, suffering from hair loss, overbreeding, heartworm disease, parasites, malnutrition. With proper vet care, patience and love, Sunshine turned the corner and went on to live another happy eight years with her devoted family. Sunshine leaves behind a wonderful legacy. Without her, Texas Cattle Dog Rescue would never have come to be. She was the catalyst, the inspiration, and the face of TCDR when it started. Thanks to her, hundreds of heelers have been given a second chance at life, just like she was years ago. 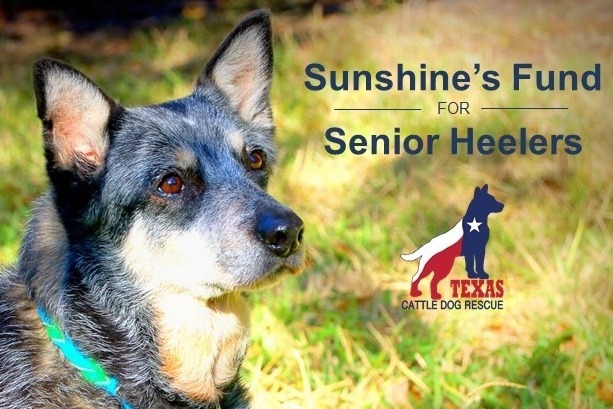 To honor Sunshine, we’ve created Sunshine’s Fund for Senior Heelers. This is to help provide the additional care older heelers need. Senior dogs often require hundreds of dollars of additional vet care—things like bloodwork, cancer surgeries, laser treatments, joint supplements, mobility assistance, orthopedic beds. This fund in Sunshine’s name will help us provide that needed care to the older Australian Cattle Dogs that we rescue. We have a soft spot for seniors and we know a lot of you do, too. Please consider a donation in Sunshine’s memory to help other dogs like her. 100% of donations will go toward the care of senior dogs and all donations are tax deductible. Texas Cattle Dog Rescue is a 501(c)(3) nonprofit organization with no paid staff. Texas Cattle Dog Rescue (TCDR) is a non-profit animal welfare organization dedicated to rescuing stray and abandoned Australian Cattle Dogs and providing medical and foster care, then placing these dogs in loving and caring homes.